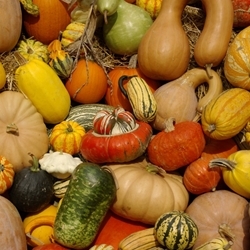 Squash varieties are divided into two types, summer squash and winter squash. Summer squash is for eating in the summer and winter squash can be stored for eating well into the winter months. Tuffy has thicker, much sweeter, drier yellow flesh than others. Black, green skin, distinctive heavy ribbing. Vining habit. Note: Take care when cutting in half as the rind is tough. For best sweetness, wait 2 weeks or more after harvest to eat. This is the standard for organic butternut squash. It has larger fruits with small seed cavities and thick, straight cylindrical necks. Fruits average 9 inches long and 4-5 pounds. Flesh has smooth texture and sweet flavor especially after 2 months of storage. Average yield is 4-5 fruits per plant.